Faro di isola della Bocca was built in 1887 as a military building. 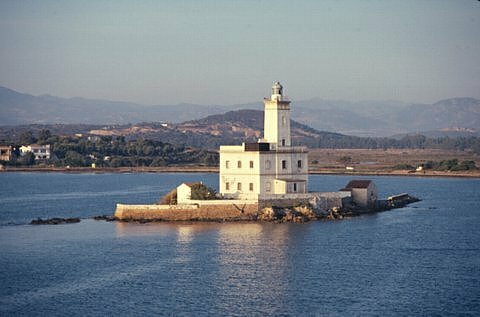 The lighthouse marks the entrance of Olbia harbour, the first passenger port of Sardinia. Take one of the many ferries leaving various ports along the western coast of Italy over to the town of Olbia on Sardegna. Ferries from mainland cities such as Genova and Livorno go to Olbia. The lighthouse can be seeing while on the ferry going into or out of the port at Olbia.